The North American distribution networks are growing at a rapid pace; in order to guide your warehouse ahead of the competition, you must retain both quality in customer inventory and quality of service. 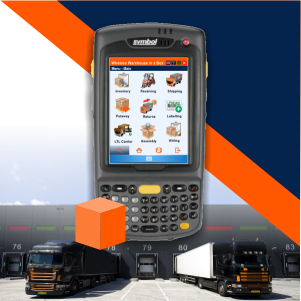 In the supply chain industry, this means to be efficient, swift and accurate – qualities inherited through our experience and applied to our WMS software — Considering the capabilities and proven success of this solution, we take pride in with our leading warehouse management system, Wireless Warehouse In A Box™. Operating time is crucial in the logistics industry; the speed you are able to locate and pick inventory, how efficient your technology is in tracking the movement of the inventory inside the warehouse, and more. Knowing these are the requirements of having a successful warehouse, our team of experts have focused on building a flawless system automating manual processes, applying mobility to activity that normally creates delay and visually enhanced process improvements. This isn’t your typical legacy, excel sheet or pen and paper solution; we bring your warehouse the complete package and then some with Wireless Warehouse In A Box™. Having the ability to provide mobile logistics, our data is delivered to you and your customers in real-time. Tracking methods of transactions, setting rates, tracking costs of all movements and determining storage types from your mobile device/scanner. Your data will no longer have restraints in visibility; CLOUDconnect™ is a component integrated in our Warehouse Management Software capable of displayed real-time, live data at anytime anywhere with an internet connection — Viewable inventory, orders statuses reports and more for you and your customers. Complete power over your warehouse from the palm of your hand and a strengthened customer relationship. Not only are we able to ensure the quality of service your warehouse is capable of delivering satisfaction;contains a key feature providing floor operators with visual inventory tracking capabilities; which locates and pinpoints your inventory location on an illustrated visual map of your warehouse displayed on your mobile device/scanner. This technology not only works as a GPS for your warehouse but it is also capable of visually displaying inventory contents and detailed information removing the chances of mistakes or misjudgment when picking. The ability to have optical logistics integrated warehousing software also provides you with easily understood user-friendly tools making the training process with new and existing employees a breeze.